Simplicity meets durability in our black pedal bin 30 liters from EKO. Available in exclusive black and neon combination, this unique bin will sit perfectly in any space. Build from high-quality stainless steel, Regent Step Bin is durable for more than 100,000 times of usage. Our R&D team has developed the very first hydraulic damper that ensures a noise-free environment. 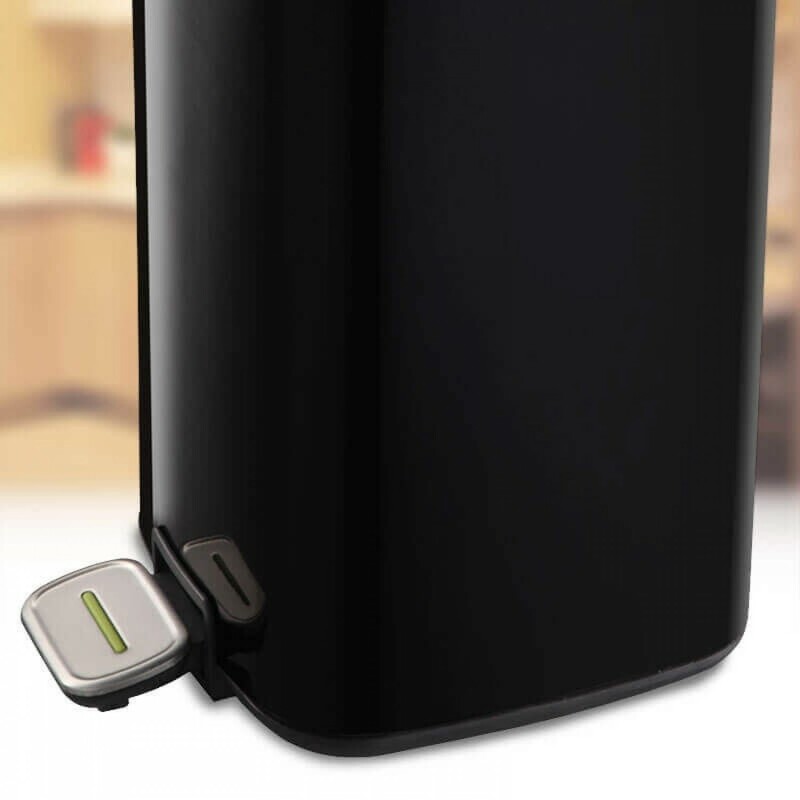 Regent black pedal bin 30 liter completes with a comfortable back handle and built-in deodorizer compartment that caters to a changeable air freshener or deodorizer to absorb odors. Eko 32L Regent Square Series, coated Black stainless steel Finish, black Pedal Bin 30 liter. Simplicity meets durability in Regent 32 liters Step foot pedal bin. Available in exclusive black and neon combination, this unique bin will sit perfectly in any space, designed in a square shape that’s flat all sides. Build from high-quality stainless steel, Regent Step Bin is durable for more than 100,000 times of usage. Our R&D team has developed the very first hydraulic damper that ensures a noise-free environment, silent close. 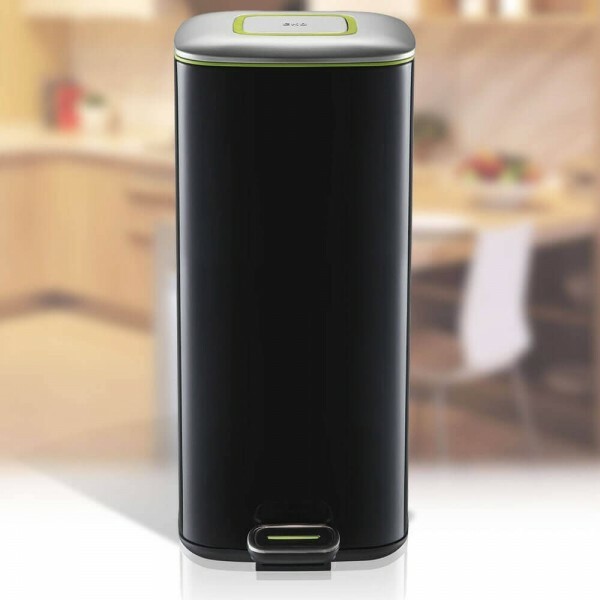 Regent Step Bin completes with a comfortable back handle for easy transportation and built-in deodorizer compartment that caters to a changeable air freshener or deodorizer to absorb odors. The 32L Regent series square bin is an ideal kitchen or office addition, made from coated black stainless steel finish, this bin has been expertly crafted inside and out. The 32 Litre is a stylish flat boxed shaped design that will look well anywhere. 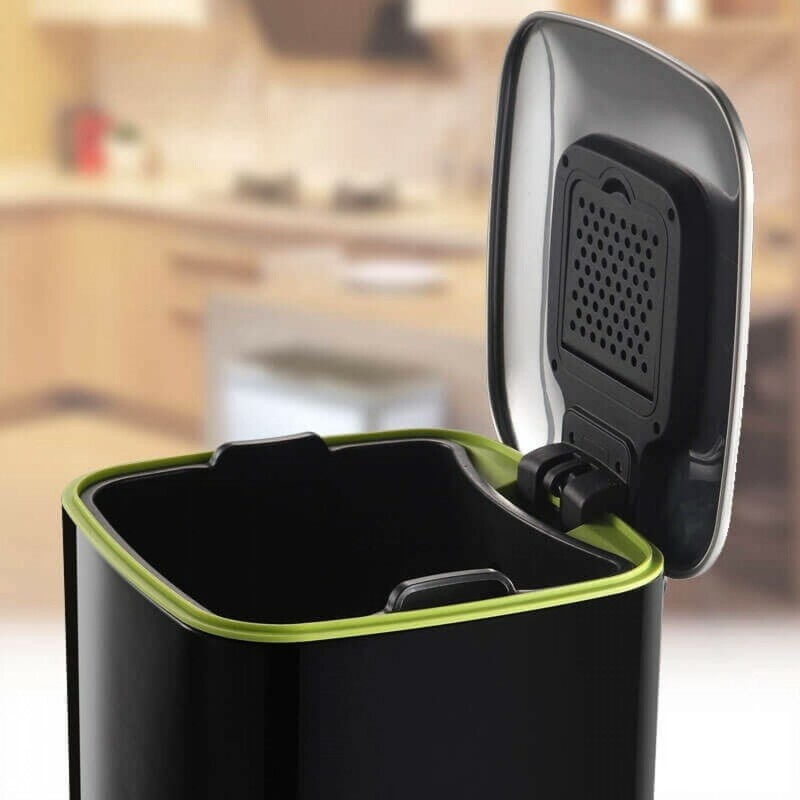 Comprised of a fingerprint-proof exterior and an interior containing a toughened ABS Neon plastic bucket, which compliments the black exterior finish, this bin is ideal for a family kitchen or as a waste-paper receptacle. A removable plastic bin liner keeps the refuse bin easy to clean and refrains from spills and leaks. The inner bucket also protects bin liner bags against rips and tears, allowing you to carry waste all the way to the curb in the inner pail itself. No more drips along the way! This Eko 32 litre regent series Step Bin is made with fingerprint-resistant, perfect for households and commercial environments. Hands-free, No Mess and no fuss. An easy way to a more hygienic, comfortable waste disposable experience. We all have to take out the rubbish: thanks to EKO, we can be clean about it!